Bathrooms are private sanctuaries in which to unwind, revitalise, ponder and pamper. At an average, we spend one and a half years in a bathroom over a single lifetime, which makes it an important part of our everyday lives! 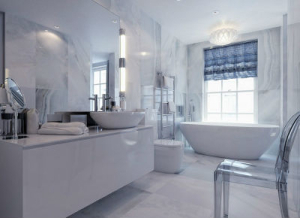 Glass utilised in bathrooms and showers is always of a superior quality. Plain glass though beautiful, can be further treated in various ways to produce beautiful surfaces and works of art. The process of Glass Etching dates as far back as the 19th Century. Decorative techniques for glass amongst which frosted patterns via etched surfaces were among the most popular. This classic quality still holds strong among modern applications of acid etched and sand blasted glass fittings. In fact, the timeless elegance of etched glass has stood the test of numerous glass treatment techniques devised over the years. Today glass adorns spaces in modern Singapore, especially residential bathrooms in neat condominiums and spacious landed properties alike. Etched glass is a popular choice for the bathroom due to its ability to block light from passing through, making it opaque in appearance. This quality makes one believe that shower cubicles and etched glass were made for one another! Apart from offering privacy, etched glass designs can transform your bathroom from a mundane tiled room to one of fresh grace and appeal. Placing a thick etched glass door on the bathroom attached to your bedroom, offers a chic look of elegance and space to the entire room. Sandblasting or acid etching the glass surface gives it the desired effect of a blurred surface, ensuring privacy and adding ethereal beauty. This is a handy application as one can see whether the light is on in the bathroom even when the door’s shut, as a sign of it being occupied! You can even artistically etch names on the door making your bathroom even more personalised. 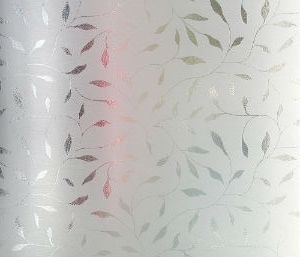 Another way to create an etched glass effect is through decals patterned to look like an etched surface. Decals are available in designs with leaves, flowers, lettering or with a laced effect. They can be smoothed on directly to plain glass via their adhesive backs. Etched effect decals are also ideal for bathroom windows. Applying an etched glass door to your bathroom cabinets or vanity cupboards, transforms them from drab installations into elegant little compartments. You can even use partial etching to be able to look inside while protecting your precious products and keeping them free from moisture. Many Singaporean hotel rooms adorn their interiors with glass walled bathrooms. It makes the room look spacious and classy. 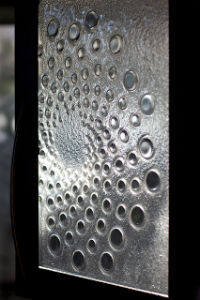 Instead of an average bland wall, try one of etched glass making it look like something out of a movie. Add some passion to your lives with this installation via playful peek-a-boo bath times! Hence, etched glass can play multiple roles in your bathroom in an attempt to make it look beautiful and private at the same time. Get creative and see which personalised design suits your style.